Do you ever get stuck in a rut. You put a few pieces of furniture in a room and there they sit … seemingly for all eternity. 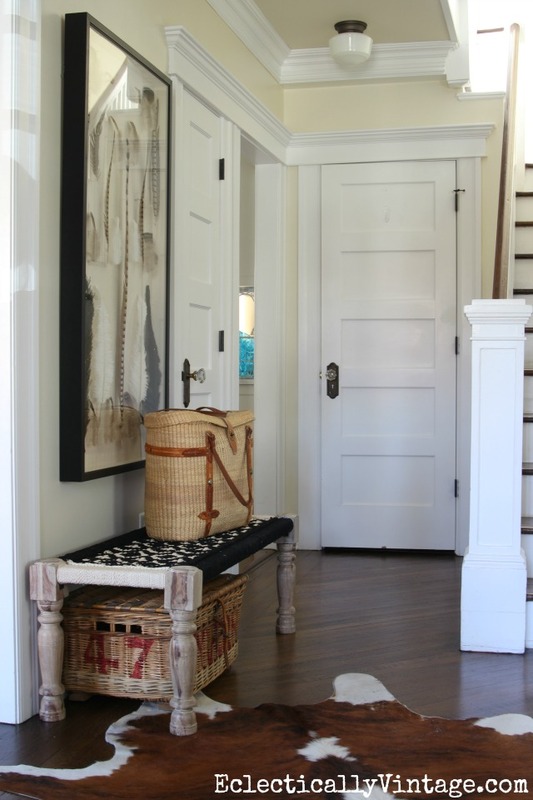 It’s good to shake things up once in awhile and look at each room in a whole new light. 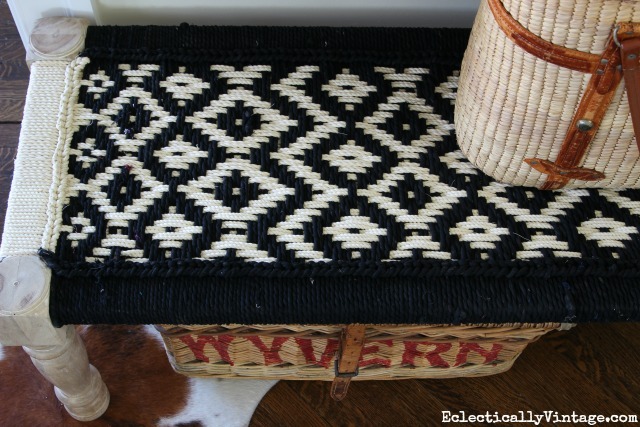 When I spotted this fun woven fabric bench, I knew I had to have it (plus I’m sharing some more of my favorite benches I found in my search at the end of this post). I love the Chindi design – an Indian tradition that repurposes leftover fabric into gorgeous home decor. Plus it’s the perfect place to sit and kick off – or put on – my shoes. 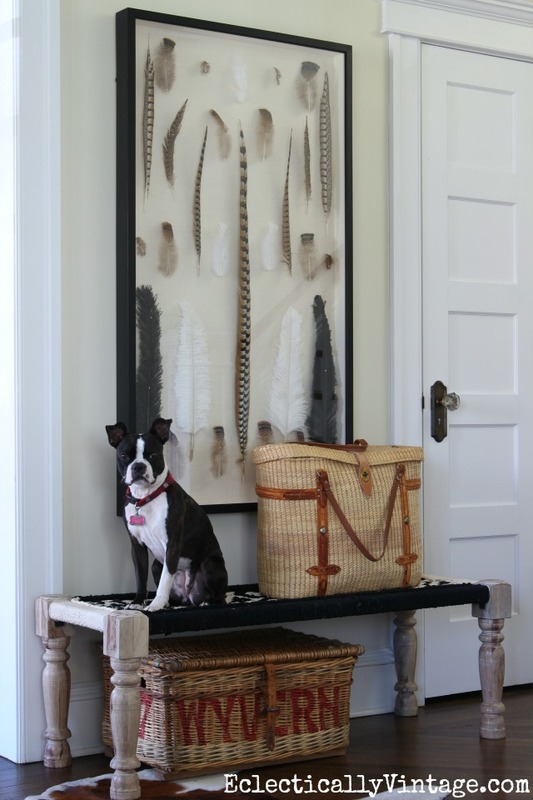 I moved my giant feather shadowbox art that had hung in another room above the bench. 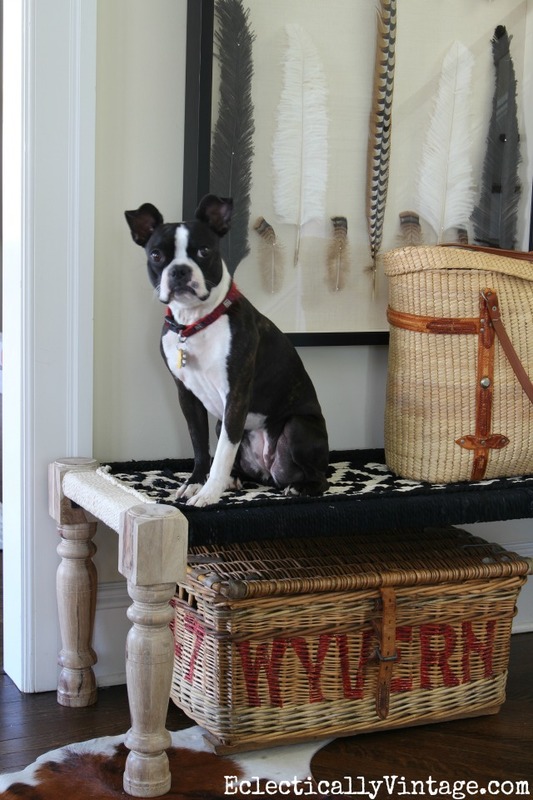 I love the graphic punch of black and white (bonus – it matches my dog, Sushi) and the woven fabric on the bench really warms up the space. A couple of vintage baskets store shoes and clutter. The cowhide rug hasn’t budged. In my quest for the perfect bench, I fell in love with these 20 benches. « Previous: My Top 10 Magic Eraser Uses! Sushi is my favorite part! But that new bench is fab, too! Sushi is blushing from your compliment! i love that bench- looks perfect! and the feather art looks awesome there. so does sushi. she should stay there. I took your advice and Sushi hasn’t been allowed off the bench for 5 days. I may have to let her outside soon! So nice in so many ways. Love the rug as well as the textures. 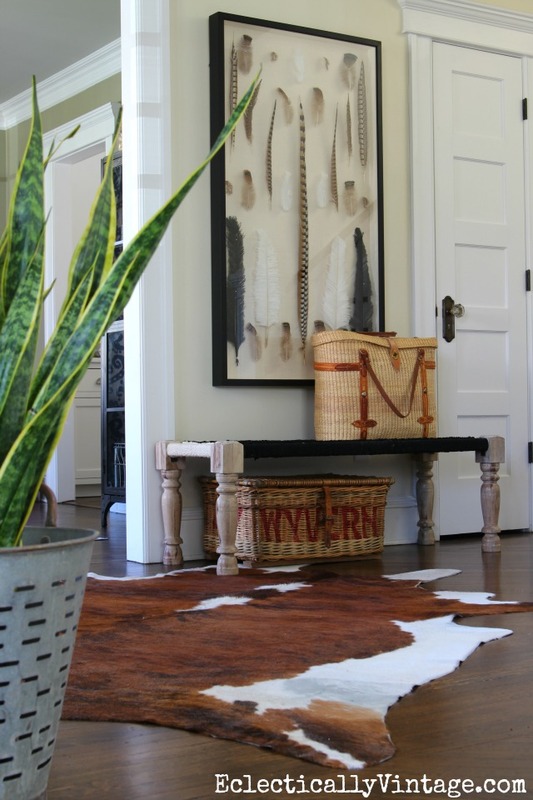 Thank you Rusha – still loving my cow hide! 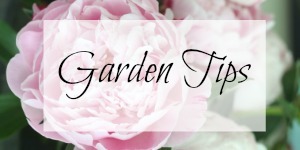 Thanks Heidi – I’m jumping all over the house but can never seem to finish a room! It looks amazing. Really welcoming. I adore that bench! So unique, what a great find. World Market usually seems to always have that piece you are looking for! Thanks for sharing. Thanks Jennifer – World Market is definitely the place for unique finds! So cute love the bench as well as the fabulous artwork. Of course your cute little Sushi always makes the space feel more welcoming! I love your bench and the feather shadow box looks wonderful. Did you buy your feather shadow box as is or was it a collection? Sushi is a great addition! I found that shadowbox art at a consignment store for $95!!! I checked the label and looked online where it was selling for almost $1,000! Score one for Kelly! 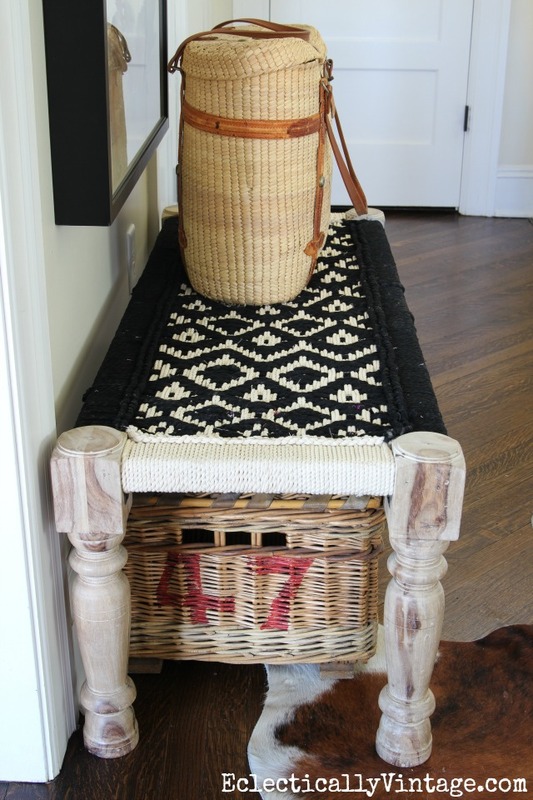 I love benches, especially yours with the black and white embroidered seat! It so unique and everything looks eclectic! HI Maria – Sushi will pose forever if I asked her to – I think she’s waiting for a treat! It was warming up but we may get snow tomorrow! Gosh at moment I am stuck in a big rut with that. I like the look by the way! 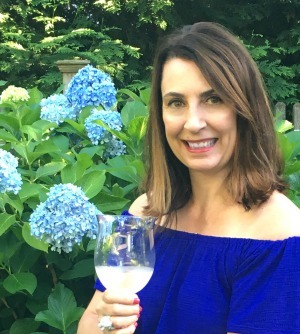 Maybe a cocktail will get your creative juices flowing Suzie! I love the new look and Sushi steals the show! Your feather shadow box art is pretty awesome too. Great new look! Sushi is a super model after all! It’s hard for any piece of furniture to compete with that!